Every year in the United States more than $400 million worth of bicycles are stolen from their owners. That's not a typo, that's a problem. Criminals are using online marketplaces such as eBay and Craigslist to efficiently sell stolen bikes to unknowing consumers with incredibly low risk. Without serial numbers, it's extremely challenging for victims to identify if a bicycle on an online marketplace is theirs or to demonstrate ownership to engage law enforcement. Today, less than 10% of recovered bicycles find their way back to their owners. Unlike automobiles (standardized VIN numbers, mandatory licensing and required incident reporting) bicycle registration is not widespread, making ownership difficult to establish. While adding the serial number requirement to online marketplaces is not a silver bullet, we collectively believe that it will meaningfully increase the friction and risk for converting stolen bikes into cash for thieves while helping​ increase the odds of successful recovery for victims. Project 529 is a new company building software for cyclists, and we launched a version of this petition earlier this summer on our website. In a few short months, the support from cyclists and the industry was overwhelming - more than 22,317 signatures - and we decided, along with the below co-petitioners to move the petition to the global Care2 network. Please join the below organizations and more than 20,000 cyclists in our war against bike theft. Ask Craigslist and eBay to require serial numbers for bike listings. Every 30 seconds, a cyclist has his or her bike stolen in the United States. Nearly half of college students with bicycles will lose them during their education. Bicycle theft is rampant in the United States, and it's due in part to the ease of fencing stolen bikes through online sites. There's a simple solution that would help dramatically cut down on these statistics: requiring a serial number when selling bikes online. Just as VIN numbers are required to list cars for sale, requiring a serial number will deter criminals from using your sites to move stolen bikes. 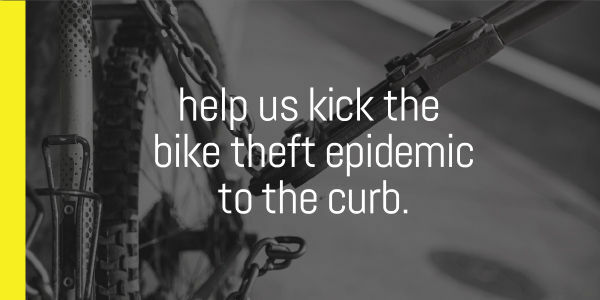 It additionally gives the victims of theft a chance of recovering their bikes. We the undersigned are petitioning eBay and Craigslist to add the simple requirement of including serial numbers for bicycle listings. We believe this poses no material impact to legitimate sellers or to your business. Please help keep this vibrant category on your sites ethical and above board. Thank you. We surpassed our goal and couldn’t be happier! Last week we printed the petition in very Portland fashion: a laser-etched wooden binder with the petition on the cover. We included a letter telling the CEOs of both organizations what changes we’d like them to make. You can see the final petition and read about the amazing journey we’ve been on at project529.com/petition. We’ll update the Care2 community here as well as via our newsletter. Join us at project529.com/garage/newsletter.